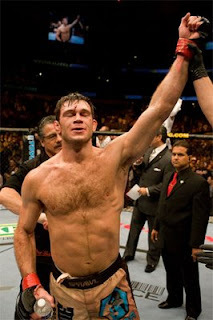 In 2003, Forrest Griffin was making the transition from a police officer in small-town Athens, GA., to a bona fide mixed martial artist with an impressive amateur record of 6-0 and a professional record of 6-1, which included wins over Jeff Monson and Travis Fulton as well as a tough decision loss to Dan Severn. Two years later, Griffin and fellow TUF season one veteran Stephan Bonnar fought a 3-round war that literally launched the UFC into the mainstream via Spike TV. Fast-forward to July 2008 and Griffin is the new UFC light-heavyweight champion after stunning back-to-back wins over Mauricio “Shogun” Rua and Quinton “Rampage” Jackson. Five years is all it took; seven if you include his amateur experience. Then there's Jeremy Horn, one of the most experienced fighters in MMA with a professional record of 88-18-5, and one of only four people who can boast wins over Griffin (a KO via kick in September 2003). Horn has been fighting professionally since 1996. But despite being considered by many to be one of the most talented and technically proficient fighters in the sport, Horn has never held a UFC title. His only title shot came in 2005 to then UFC champion Chuck Liddel, who had been lobbying for a chance to avenge his 1999 loss to Horn. Two different fighters. Two different paths. One rose to the top relatively quickly, the other seems still to be falling short of the coveted peak. Thousands more never seem to make it at all. Of course, the biggest mystery of all is that the “success” stories such as Griffin's cannot always be attributed to things such as talent or expertise. Griffin is the first to admit that he isn't at the top because of some superhuman advantage. “I'm not a feared guy...you look at the champions. Anderson Silva: terrifying. B.J. Penn: terrifying. Every other champion but me is pretty terrifying. I'm just a dude trying to put it together. But the one thing I've got is I'm going to fight you to the end, like a dog” (Sherdog.com, UFC 86 Fallout: Possible Protest, Rematch). Like so many of their peers, Griffin and Horn are both great fighters, both respected, both deserving of recognition. So why is it that only Griffin has reached the peak? I suppose the same question could be asked for many of us. Why it is that some experience breakthrough while others continue to struggle? Only God knows. But one thing is certain; failure is eminent ONLY if you quit. When your breakthrough does finally arrive, like that unexpected uppercut or a sneaky choke, it will be traveling at the speed of light. You may labor for what seems like an eternity with no evidence of reward and then suddenly—BAM!—the tide turns and you are basking in the sweet savor of success. Don't ever give up on yourself and your faith in God to accomplish great things through your life. They that endure to the end will ultimately be the ones standing with their hands raised in victory!